Leslie Hale is the new CEO of RLJ Lodging Trust. (Washington Post photo by Ricky Carioti). Leslie Hale is the new CEO of RLJ Lodging Trust. 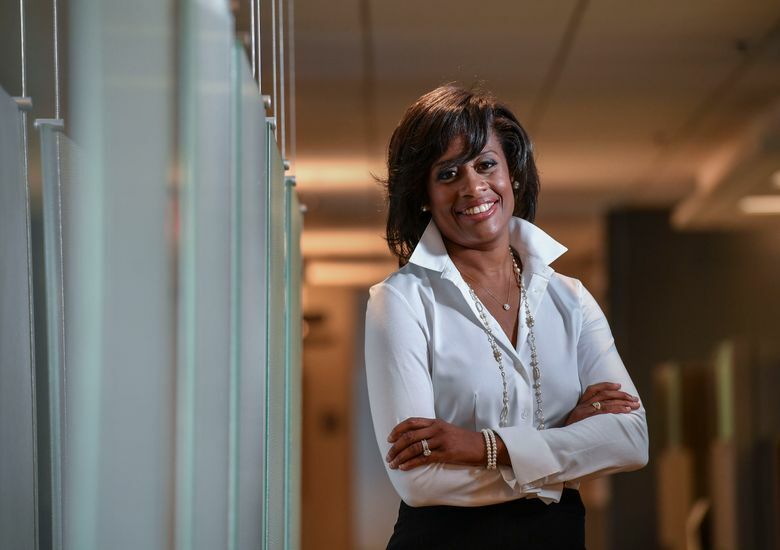 Her promotion makes her the first African American woman to be chief executive of a publicly traded real estate investment trust. The 46-year-old math whiz, the granddaughter of a Tennessee sharecropper, has traveled a long way from those days, geographically and aspirationally. Last month, Hale became the chief executive of RLJ Lodging Trust, a Bethesda, Maryland, hotel company with nearly 30,000 rooms at 153 properties across the United States. It has a market cap of $3.8 billion. Hale’s promotion makes her the first African American woman to be chief executive of a publicly traded real estate investment trust. She is also on the board of Macy’s. “I am humbled, and honored to be the first, but I have no interest in being the only,” she said. The product of Los Angeles public schools, she attended Howard University, where she is a trustee, and Harvard Business School. How do you get from the streets of Los Angeles to the executive suite? The takeaways, to borrow a term from business school, are friends, family and mentors. Family has been a huge part of her life. Hale had entrepreneurial, committed parents as role models. It created a backstop for taking risks. “Every accomplishment I have ever had in my life has been a family affair,” she said. Family also fueled a certain confidence and ambition. Hale, who had served as RLJ’s chief financial officer for 11 years, is now commanding a multibillion-dollar real estate investment trust that must grow revenue and guard the healthy dividend, which is north of 6 percent. Dividends are the altar at which REIT shareholders worship. Hale’s responsibilities are two-pronged. She must oversee the managers who run the day-to-day operations of RLJ’s fleet of hotels, while also keeping a close eye on the company’s balance sheet. RLJ’s hotels are managed by Marriott, Hilton and Hyatt, and are mostly in large cities that service business travelers. “We are not into big hotels or luxury hotels,” Johnson said. RLJ doesn’t do big tourist hotels or destination spas or resorts. Hale said she will continue to sell off the luxury hotels that came with a big acquisition the company made a year ago, while also paying down the $500 million debt that the company committed to erasing. The Howard University finance major is one of those rare people who love digging down into numbers, balance sheets, and profit-and-loss statements. She joined General Electric, then one of the world’s most respected corporations, after graduating from Howard in 1994. She cut her teeth at General Electric Capital, where she worked on major transactions in mergers and acquisitions and in real estate. GE is where she met one of her first mentors, a senior executive named Art Harper. “Harper told me that I needed to earn my seat at the table every day,” she said. Someone also advised that if she wanted to be at the table, head to the revenue side of the business. After stops at Harvard and Goldman Sachs, she eventually settled on RLJ in 2005. One person who recommended her for the job was another mentor, the late Alan Braxton, who was a major figure in real estate and finance. Braxton’s advice changed her life. “He asked me a simple question: What are your peers doing? That one conversation changed not only the way I viewed the world, but, more importantly, changed the ways I viewed myself in the world.